$160 billion, at the very least. That's how much this report estimates hunger costs the U.S. economy in poor health outcomes and additional health care every year. America's hunger bill is much greater than we may realize, affecting educational outcomes, labor productivity, crime rates, Gross Domestic Product, and much more. The overall costs of hunger and food insecurity to society may well be incalculable. But this report argues that hunger and food insecurity are a health issue, and it is possible to produce a reliable, albeit conservative, estimate of the health-related costs in particular. The estimates presented here are based on an extensive assessment of peer-reviewed research on the many ways that hunger harms human health, and the higher health care costs associated with them, updated to 2014 dollars. The graphic below breaks down America's $160 billion hunger health bill. How do the costs of hunger stack up? When policymakers cut SNAP benefits to reduce the federal budget deficit, these "savings" evaporate the first time a former SNAP recipient with diabetes ends up in the hospital after running out of the food needed to manage his condition. The healthcare costs of hunger and food insecurity for one year (2014) in the United States are estimated at $160.7 billion. This is a conservative estimate based on a survey of empirical research published in academic journals, conducted by John Cook of the Boston Medical Center and Ana Paula Poblacion of Universidade Federal de São Paulo. Those estimates, combined with another $18.8 billion in poor educational outcomes bring their total cost estimate to $178.9 billion. This is a very conservative estimate because Cook and Poblacion's findings are based on only the health conditions covered in the academic literature they reviewed. The estimate leaves out, due to insufficient information, a number of costs that seem like safe bets to be associated with hunger and food insecurity. One example: the effect of hunger and food insecurity on the costs of medication nonadherence, which is so commonly seen in and out of health care that it has its own catchphrase, "treat or eat." 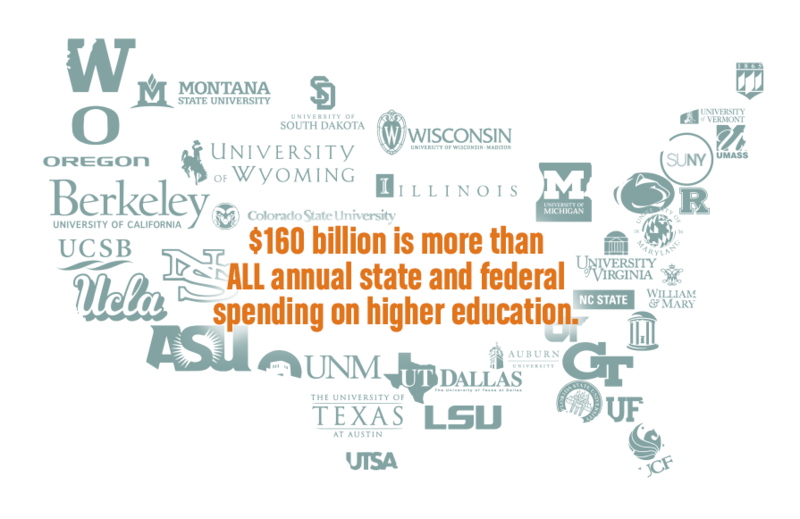 Yet as the graphic above shows, even conservatively estimated, the health costs of hunger are greater than some of the country's most expansive public investments, like higher education. This report, published by Bread for the World Institute and prepared by researchers from the Boston University School of Medicine and the Universidade Federal de São Paulo, aims to ignite a conversation among U.S. policymakers and the health care community about strategies to lower the shamefully high costs of hunger to the U.S. economy.